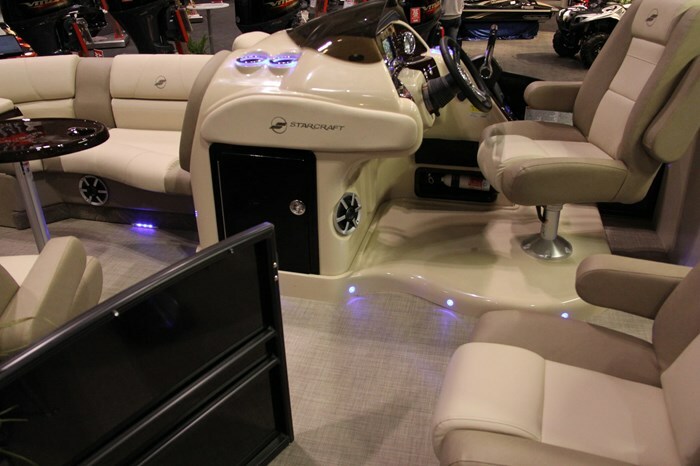 Starcraft Marine of New Paris, Indiana is arguably one of the most prolific and diverse manufacturers of pleasure boats in the world. Consider this. 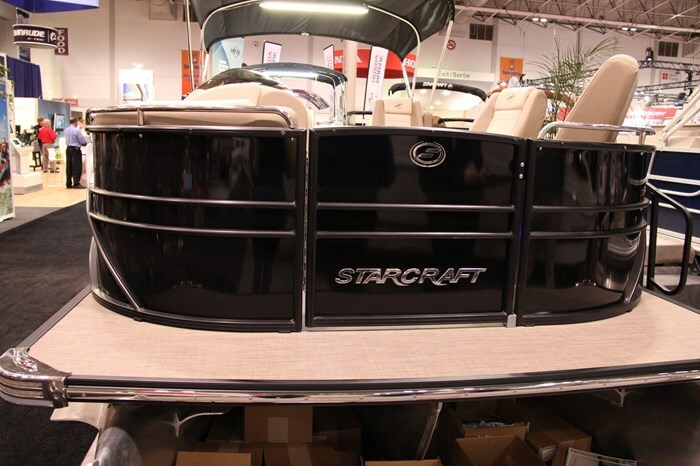 For 2015, Starcraft offers well over one hundred models of boats from ten to twenty-five feet, manufactured in both aluminum and fibreglass, some outboard powered, others sterndrive powered, in seven distinct series including runabouts, fishing boats, deck boats, pontoon, utility, jon boats, plus a crossover series. All four variations in the MX 23 series are actually twenty-four feet, ten inches length overall. 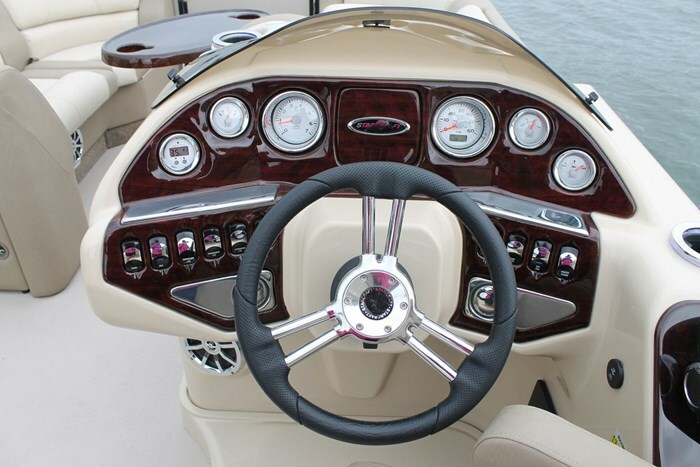 All have a standard rating of 150 horsepower of the outboard brand of your choice. 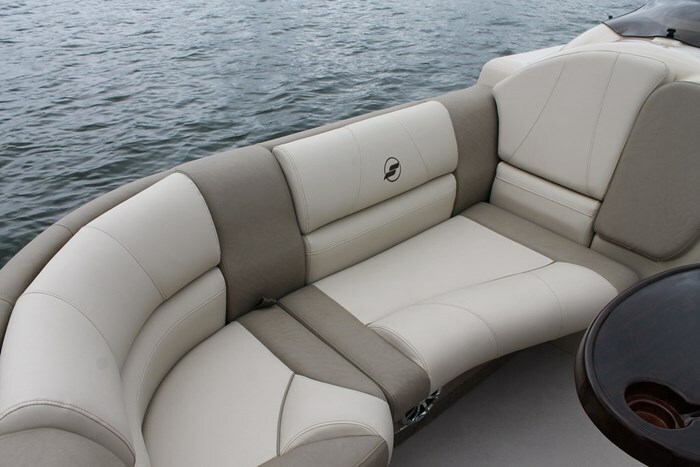 The four MX 23 model variations, C, CP, L, and LP depend on the interior seating/lounging configurations: stern double sunpad with a stern portside L-shaped lounge or twin single stern lounges with a portside captain’s chair and with bow portside lounge or bow portside twin captain’s-style chairs. 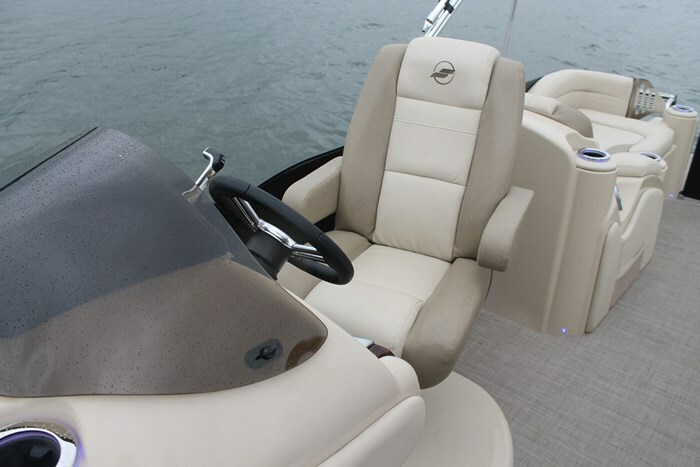 The MX 23 LP variation provides the twin single stern loungers with a portside captain’s chair opposite the captain’s helm chair plus two more of these captain’s chairs on the portside bow ahead of the portside entry gate. 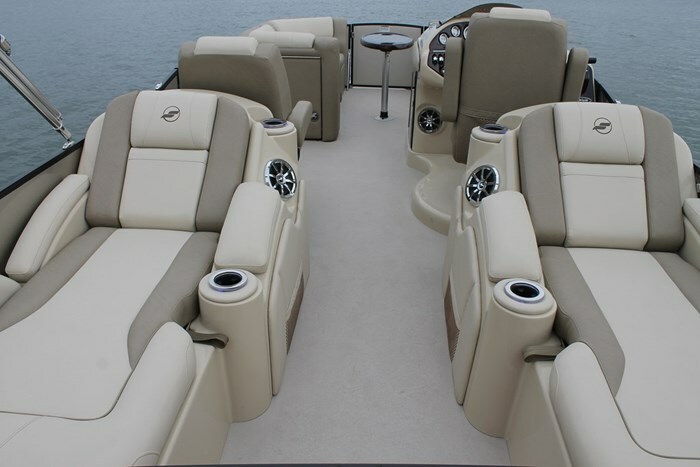 On the starboard side bow on all models is a full-length stretch-out lounge seat with padded backrests. All furniture bases are Rotocast composite with integrated drains and all upholstery is Soft Touch Vinyl in standard Distinct Beige colour. Seating capacity is rated for thirteen persons. The starboard side captain’s high back reclining chair with slider and flip-up armrests faces a custom molded deluxe fibreglass console with tilting spoked steering wheel, recessed knee room, footrest, lighted toggle switches, tinted windscreen, and chrome-accented gauges including speedometer, tachometer, fuel and trim gauges plus voltmeter. An in-dash digital depth gauge is optional. Standard is an AM/FM stereo with Bluetooth connectivity and auxiliary MP3 port. Interior courtesy lighting and docking lights are standard as is a colour-coordinated ten-foot bimini top with storage boot. 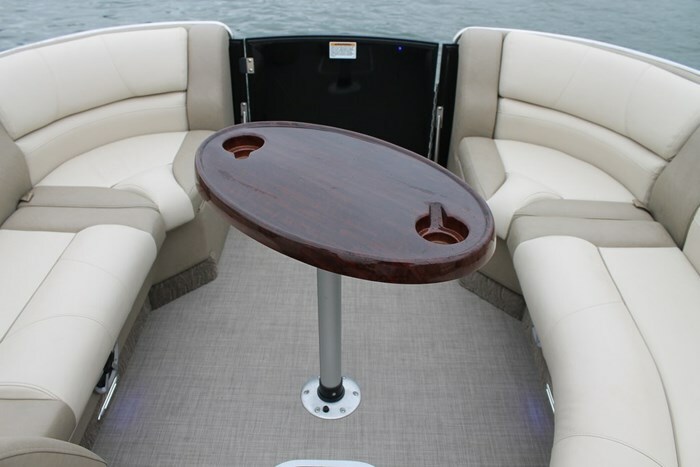 Also standard is a removable bow table with cupholders and a four-step telescoping boarding ladder. Standard interior flooring is 28-ounce sculptured Mica Mist carpet with brown Teak Weave vinyl in the stern boarding area. There are six standard MX colour panel options with six corresponding bimini top colours. There is also an MX (Gray) overall colour option which changes the upholstery, flooring, bimini top and panel colour choices. There are also several overall or partial flooring options including regular vinyl, snap-in carpet, Sea Weave vinyl, vinyl-teak, synthetic teak, and teak weave. Choices of Vista solution-dyed polyester, colour-fast and colour-matched canvas include a playpen cover, double top, and half or full camper enclosures. Other options include an additional table, aluminum swim platform, ski tow bar, walk-in change room with or without a porta-potti, Babbito underdeck blue LED lighting, underwater lighting, floor lighting, lighted cupholders, stainless steel grill, a cooler table, and a bow gate seat. The MX Premium Package gives you most of the above extra lighting options plus black anodized rails and trim, a helm platform, and stainless rubrail. The MX Prestige Package gives you all of the Premium Package plus dash treatment, upgraded Polk stereo, stainless gate and grab handles, plus a Murphy touch screen. One of the neatest options is this Murphy touch screen control system which displays all gauges and motor functions, air and water temperature, controls for all exterior and interior accent lighting, is a stereo remote with Bluetooth and three video inputs, plus it is a GPS chartplotter with compass heading. The MX 23 LP comes standard with two 27” diameter tubes with a 20” transom height. From here, there are several choices available. You can simply add an aluminum underdeck performance shield for improved water flow. Add the HMX Performance Package which gives you this shield plus a full-length third centre tube plus performance lifting strakes. The third tube increases maximum rated horsepower from the 150 to 250. The HMX PR 25 Performance Package gives you all of the above plus a ski tow plus Sea Star hydraulic steering plus raises the transom height to 25 inches and increases the built-in gas tank from the standard 30 gallons to 60 gallons. 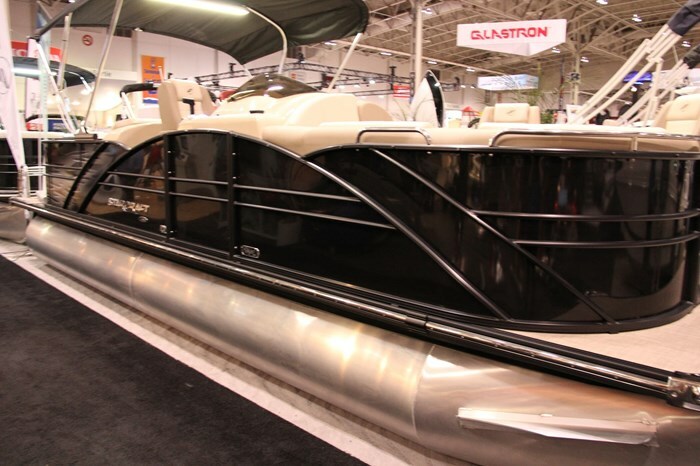 The PTS Performance Package reduces the length of the centre tube to incorporate a traditional transom and is said to create a lighter option for better performance and fuel efficiency. Starcraft offers lots of choices, lots of options and one that could be just right for you.